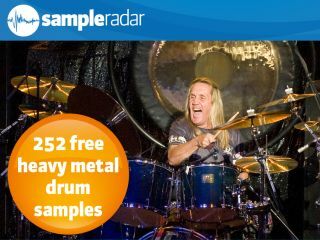 Iron Maiden drummer Nicko McBrain: hits his drums hard. SampleRadar doesn't like to miss out on a celebration, so it should come as no surprise that it's getting involved in the devilish spectacle that is MusicRadar's Metal Week. Following last year's giveaway of 400 free heavy metal guitar samples, we're supplying you with a varied collection of drum loops in this most brutal of genres. Both acoustic and electronic beats are included, and they come at a wide range of tempi. The samples are split into two folders: acoustic and electronic. Each of these contains sub-folders that are labelled by tempo. The heavy metal drum samples are supplied in a zip file, so you'll need to extract them before you can see them. Enjoy!